Prescription glasses help if you are nearsighted, farsighted, have astigmatism, or suffer from almost any other eye problem. Dr. Barry Leonard’s optometry office stocks more than 1,000 different styles of frames from dozens of manufacturers. Convenient, all-in-one eye care means you’ll find the perfect fit just moments after getting your prescription. Dr. Leonard’s office walls are filled with frames for anyone. 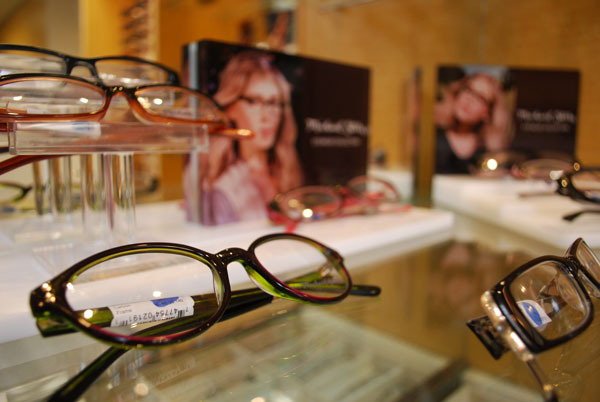 Men’s eyeglass frames and women’s eyeglass frames are stylish and comfortable. Our selection of children’s eyeglass frames are specially made for the active school lifestyle. Prescription Glasses, Sunglasses and Designer frames -- almost 1,000 available at Dr. Barry Leonard's huge showroom. You will also find prescription eyeglasses in almost every style imaginable, from durable generic manufacturers to the most fashion-forward designer frames from Gucci, Michael Stars, Fendi, Kensie, Coach, Oakley, Ray-Ban, Dakota Smith, and more. We even have great glasses for kids by Converse, Lucky Brand (and specialize in children’s optometry). Lenses are sometimes manufactured right on the premises. But, no matter where the lenses are created, you have the option of having your lenses upgraded with a specialty coating. These lens treatments include anti-scratch coatings and full UV protection. “Photochromic” coatings will automatically turn your indoor, clear lenses into sunglasses when you step into bright light. Ask Dr. Leonard for a recommendation on which coatings are right for you. Of course, you can also get virtually any pair of prescription glasses made as sunglasses, too. Then, you can look great and see great indoors or out. Shopping for prescription glasses? 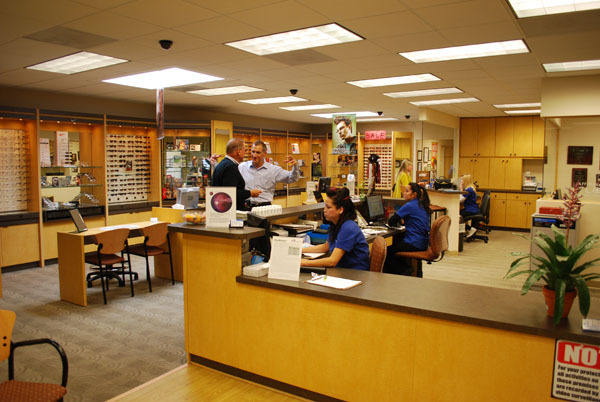 Our comfortable, modern showroom is staffed with experts to help you find the perfect pair of prescription glasses, sunglasses or contacts. Some of us, as we get older, need different vision correction for far or near vision. That’s what bifocals, trifocals and progressive lenses are for. The top part of the bifocal has a prescription for distance vision. The bottom part of the bifocal has a prescription for near vision, usually for reading. Trifocals have a third prescription in the middle, for mid-range vision. These are great for working at a computer. Bifocals and trifocals have a line in the lens that divides the different prescriptions. Progressive lenses can be either bifocals or trifocals, but the transition between the different prescriptions is smooth and has no line. From a distance, it is hard to tell that you are wearing progressive lenses. So, they are usually more attractive. Either way, Dr. Barry Leonard will make sure that you are vision through your new glasses is perfect. Your glasses will be custom fit for you right here in the office. Dr. Leonard’s expert Optometrist staff will tweak and tune your glasses so that they feel good when you wear them, look great on you, and most of all, so that you can see clearly and effortlessly all the time. Even though prescription glasses can help you see perfectly, and look great on you, sometimes they are not the right method of vision correction for your unique situation. Some people simply prefer not to wear prescription glasses at all. Contact lenses offer an excellent solution for vision correction, without carrying around prescription glasses. Contact lenses are tiny little lenses that fit right on your eye. Some conditions, like Keratoconus, can only be corrected with special contact lenses. And with most eye conditions, you also have the option of LASIK surgery. This quick procedure actually reshapes the lenses in your eyes to improve your vision. Are You Ready for Your New Prescription Glasses? Choosing an eye doctor is the first, and most important step in correcting your vision, no matter what your vision problem is. That is why so many people choose the best eye doctor in the Valley, Dr. Barry Leonard. Call now to make an appointment to see Dr. Leonard today! 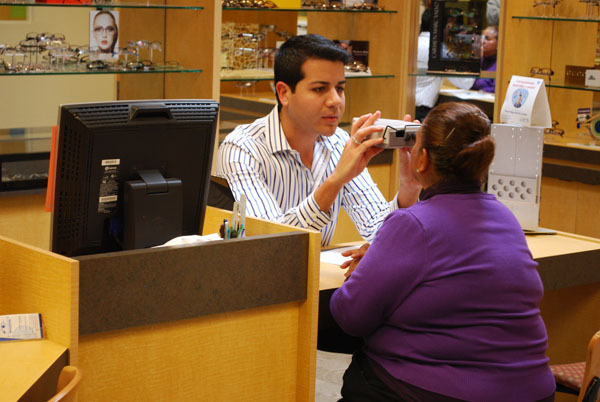 Picking up your prescription glasses is fast and easy at Dr. Leonard's office, conveniently located in the San Fernando Valley. Our experts will ensure a proper fit and you'll love clearly seeing the way you look!